Knotting and suturing is must learn skill for any laparoscopic surgeon, gynaecologists and urologist. Without knotting skill one can not expect to perform advanced surgery. 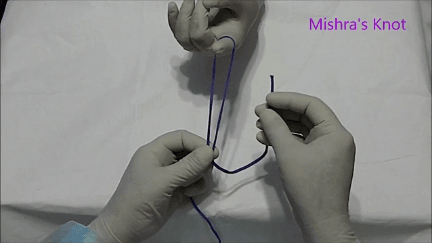 Prof. Mishra's Mishra Knot was published in World Journal of Laparoscopic Surgery in 2007 and since then hundreds of surgeon all over world is using this knot. OBJECTIVE: In this study, Extra corporeal knot-tying techniques of different knots have been evaluated and compared, in the previous study conducted there has been a scarcity of objective scoring systems in these comparison studies. At World Laparoscopy Hospital using an objective scoring system, we aimed to compare 3 types of popular extracorporeal knots: Roeder's Knot, Mishra's Knot and Tayside knot for their Knot Quality and their rates of slippage. MATERIALS AND METHODS: Fifty surgeon who came for training at World Laparoscopy Hospital tied 100 knots in the 3 knot categories. The knots tied were evenly distributed amongst the 50 surgeons with each surgeon contributing at least 30 knots. These knots were tied in a nonrandomized fashion.In the lab of World Laparoscopy Hospital and forces were measured using a tensiometer and an objective scoring system, the Knot Quality Score of different knot, which is used to compare the knot's strength and rates of slippage. RESULTS: In this study median Knot Quality scores of the 50 groups were not all the same. The median Knot Quality Score in this study and variance for the extracorporeal Mishra's knot group was 0.34 and 0.0069, respectively. For the Roader's knot group, and Tayside knot group the median Knot Quality Score and variance was 0.28 and 0.00017, respectively. Follow-up analysis revealed that the Knot Quality Score medians (0.32 versus 0.28) of the extracorporeal Mishra's Knot and Roader's groups were significantly different (P<0.0001). The medians of the Roader's and Tayside knot groups (0.29 versus 0.31) were also statistically significantly different (P<0.0001). There was no statistically significant difference in Knot Quality Score scores between extracorporeal square-knots and intracorporeal flat-square knots. CONCLUSION: Extracorporeal Mishra's Knot and Tayside Knot can tolerate better distraction forces and thus have higher median Knot Quality Score scores compared with Roeder's knots.